Bahamas Paradise Cruise Line (BPCL), the only provider of two-night cruises departing daily from the Port of Palm Beach to Grand Bahama Island, is kicking off 2019 with a collection of active new excursions and offerings. According to the Trekk Soft 2019 Travel Trends Report, adventure travel is on the rise with 43.4% of travelers seeking to “get off the beaten track,” 26.6% wishing to “see or do something new,” and 25.5% looking for “high adrenaline activities.” These adventure lovers will now be able to choose from deep-sea fishing and scuba diving amidst vibrant reefs to bicycling the island’s stunning landscape. Travelers of all ages can explore the beauty and thrills of Grand Bahama Island from both land and sea. Grand Bahama Island is world-renowned for its excellent deep-sea fishing, laying claim to 50 lucrative world records. Guests can now pair their two-night cruise with an offshore fishing excursion led by a friendly and experienced captain for three and a half hours at sea angling for sailfish, swordfish, marlin, mahi mahi, wahoo and tuna, to name a few. Those wishing to opt out of fishing can still join the fun can pre-pay for a lower “spectator” rate and cheer on their friends and family. Guests not quite ready to return to the ship after their fishing journey can enjoy extra time to shop or relax on the beach. Prices begin at $372/person ($268/spectator) for two-night cruise and Fishing Adventure Bundle. Grand Bahama Island’s reputation as a diver’s paradise is evident by its crystal-clear waters, detailed coral gardens, playful dolphins and inviting blue spaces. Guests can now combine their two-night cruise with an unforgettable PADI-certified diving experience at one of Grand Bahama Island’s dazzling reefs, as well as an all-inclusive resort beach pass featuring food and beverages. Upon arrival in Grand Bahama Island, guests can take advantage of early transportation to the stunning Viva Wyndham Fortuna Beach Resort where they can soak in the sun at the beach and pool before heading to the diving center for their scuba orientation. A catamaran will then sail the group to their dive sites where they will enjoy exploring at depths of up to 15 feet amidst beautiful underwater gardens teeming with vibrant reefs and colorful fish. The day concludes with a return to the resort where guests can enjoy cuisine and drinks by the beach or pool. The best of all. divers don’t have to worry about the 24-hours required before flying rule. Prices begin at $359/person for two-night cruise and Diving Adventure Bundle. Cruisers can uncover the magnificent wonders of Grand Bahama Island with the fun and convenience of a guided bicycle tour. The five-hour tour includes a delicious lunch at the Garden of the Groves, a lush tropical park, home to vibrant wildlife, waterfalls and fountains, followed by time to shop and relax on the beach. Accompanied by a friendly and knowledgeable guide, riders will learn all about Grand Bahama Island’s intriguing history and follow trails that were once used by early settlers, marked with exotic palm trees and stunning homes. Prices begin at $89/person, to add on to any cruise. Guests can explore Grand Bahama Island with their friends, bike club or bike association by bringing their personal bicycles aboard the ship at no extra charge. Unlike other cruise lines that charge guests to bring their own, Bahamas Paradise Cruise Line invites cruisers and their companions to keep their road, triathlon or cruiser bikes with them in their stateroom for free. Once onshore, guests can ride for miles at their leisure, touring the Heritage Trail, unspoiled Barbary Beach or endless miles of powdery beaches and charming paths lined with palm fronds and tropical flowers. This collection of Bahamas Paradise Cruise Line’s active new excursions and offerings is ’is the perfect opportunity for guests to add different adventures to their cruise getaway. 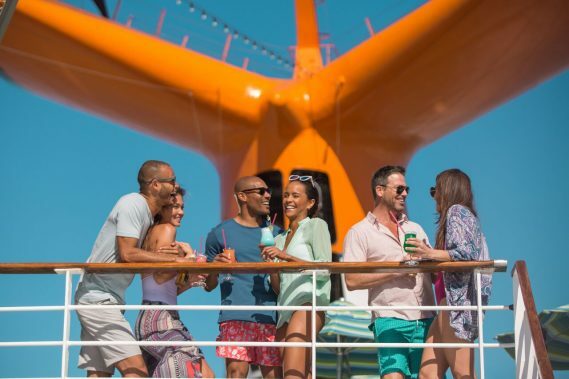 Of course, passengers will be able to enjoy all the perks the cruise has to offer as well, including testing their luck at the casino, Vegas-style shows, special spa treatments, a variety of fine dining and casual restaurants, and all kinds of fun activities. For more information on Bahamas Paradise Cruise Line or to book a cruise, please visit: www.bahamasparadisecruise.com. Two-night cruises start at $139 per person.